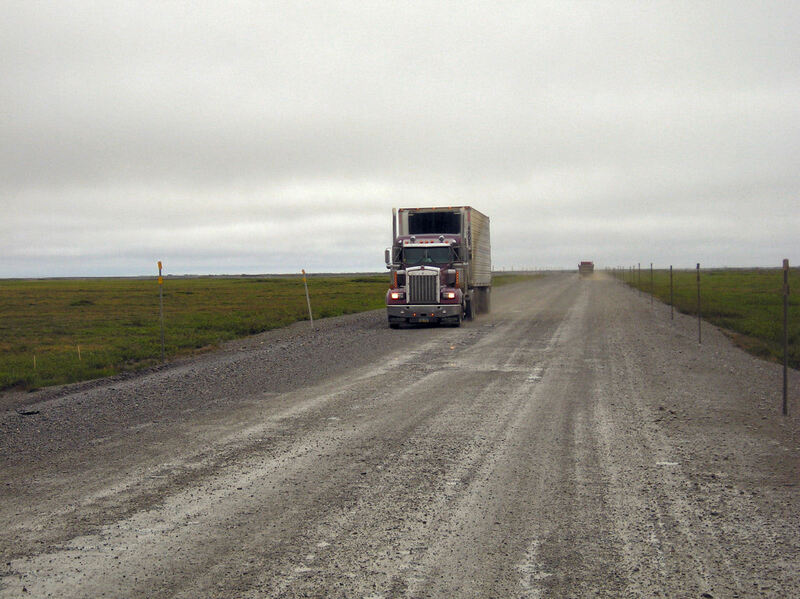 The Dalton Highway is a rugged 414 mile road that starts 84 miles north of Fairbanks, Alaska and crosses the Brooks Range to go to oil fields at Prudhoe Bay. The Elliott Highway is paved and the Dalton Highway has just over 100 miles of paved road, the rest is gravel surface. Some of this gravel has rough surfaces, so I was happy to have 700x35 tires. The original road was built in 154 days in 1974, for construction and maintenance of the Alaska Pipeline, and was also known as the "Haul Road". 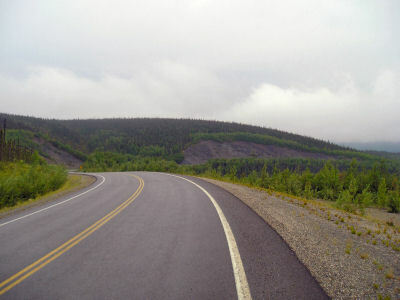 Originally just open for official traffic, the road was opened to tourists in 1995. 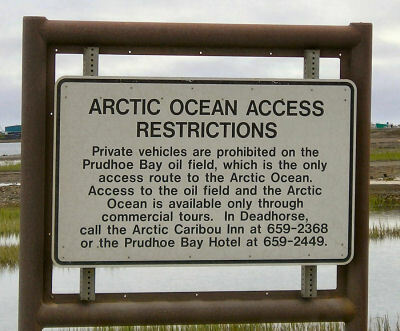 However, the last few miles to the Arctic Ocean is still closed to all but oil field traffic. The is a fair amount of truck traffic. 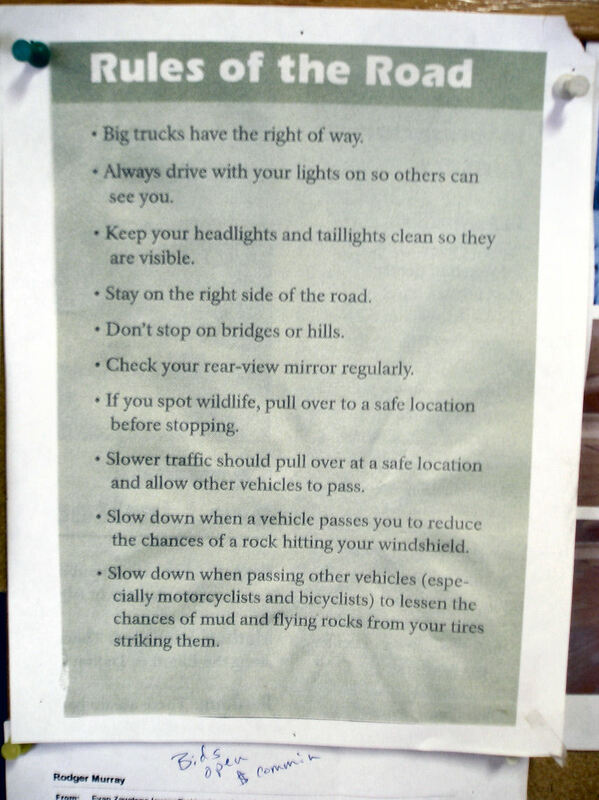 After Coldfoot, I think >50% of vehicles on the road were trucks. 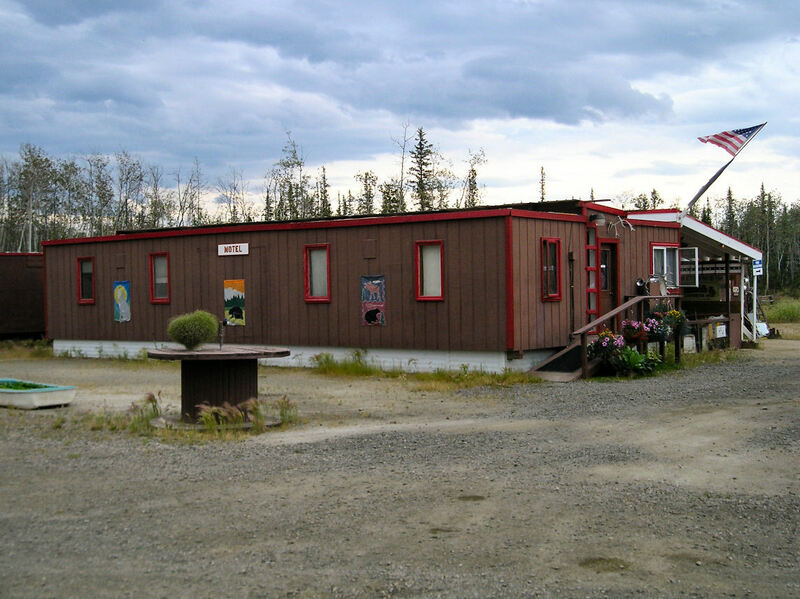 One good resource for travel in this area is The Milepost. 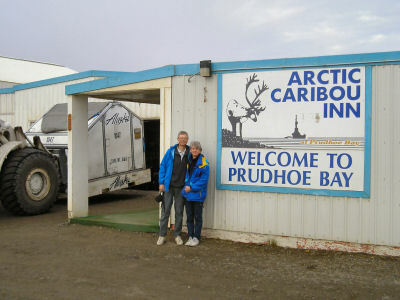 Arctic Oilfield Hotel, Arctic Caribou Inn, Prudhoe Bay Motel at mile 415. 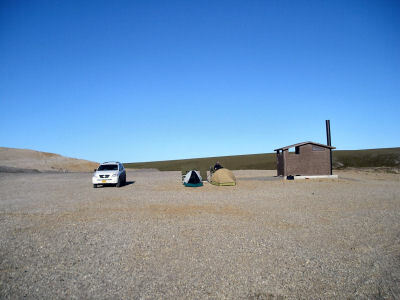 Otherwise there are places to camp along the way and pit toilets at Finger Mountain (mile 98), Arctic Circle (mile 115), Gobblers Knob (mile 131), Grayling Lake (mile 150), South Koyukuk River (mile 156), Marion Creek (mile 179), Middle Fork Koyukuk River (mile 204), Last Spruce Tree (mile 235), Galbraith Camp (mile 274) and Last Chance (mile 355). The highest point along the way is Atigun Pass at 4800 feet. With exception of some 10-12% climbs, it seemed like the mountain areas were more level than other parts when the Dalton Highway sometimes goes from drainage to drainage. Mid-summer is the wettest time of year and with the most mosquitos. 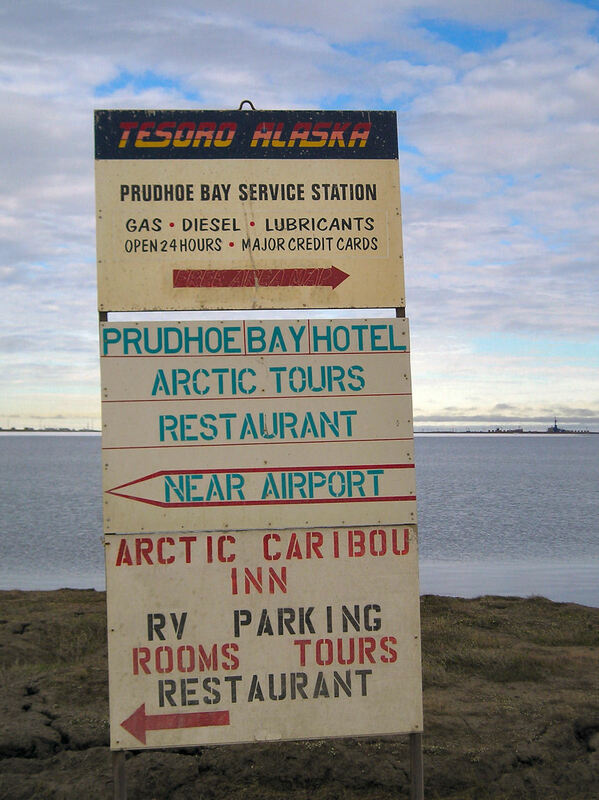 However, the sun is also above the horizon for 24 hours at Prudhoe Bay. 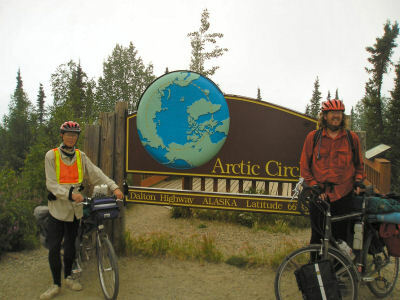 This web page provides a journal and photographs of a bicycle trip from Fairbanks to Prudhoe Bay made in July of 2005. A slow steady rain to start the trip, was this a sign of things to come? 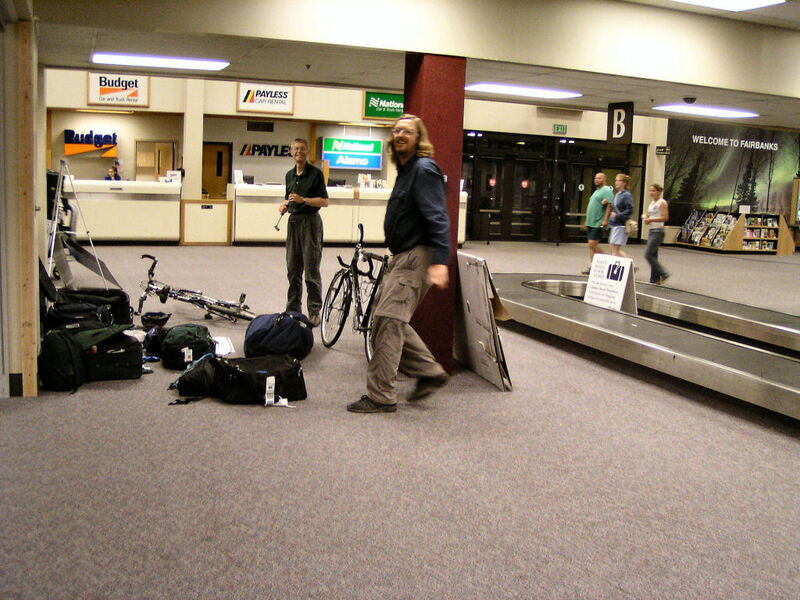 It was 1:30am by time bicycles were assembled, and we departed for five mile ride to the motel. Despite this being middle of the night, the northern lattitude meant it was still twilight. The plan was for my brother Bert and myself to cycle 84 miles north from Fairbanks, to start of the Dalton Highway. 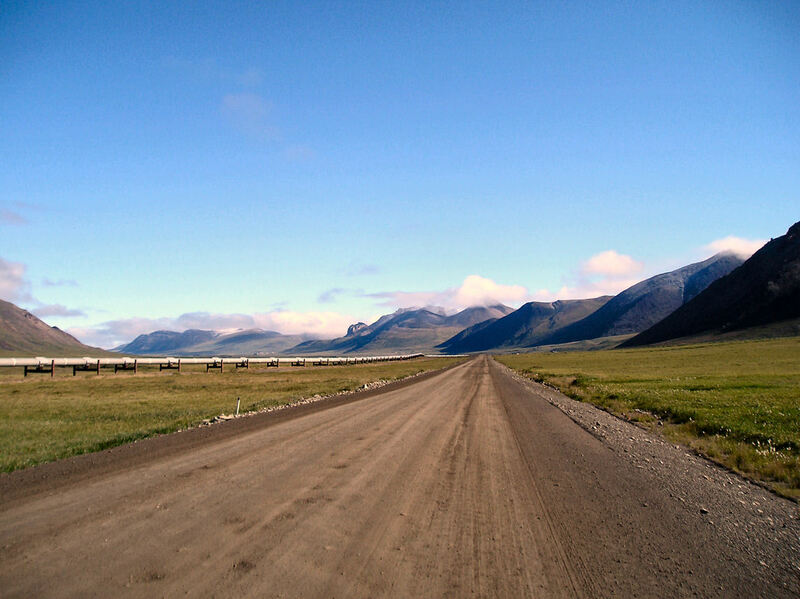 From there a ride of 414 miles on the Dalton Highway. Jean (Bert's wife) would first go explore other parts of Alaska and then meet us halfway up the Dalton. Cycling went quickly on the main road (later found out it no bicycles allowed on these and other Fairbanks roads). After five miles made a right turn. Unfortunately, the motel wasn't on the main street, so extra two miles of soggy riding. Got a good chance to see our light rain jackets meant we were soaked. Time to put rain jackets on the "provisions list". The trip begins! Today a sometimes soggy and sometimes hilly ride to Joy. 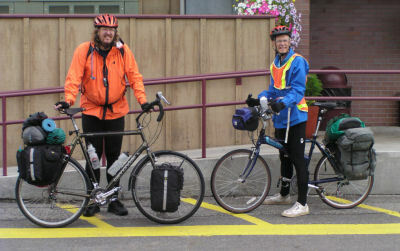 Before we could start, we found local Fred Meyer store to stock up on rain jackets, food and other provisions. 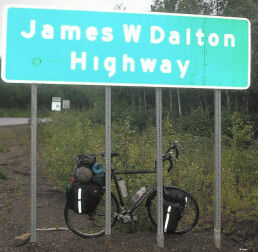 Plan was for Jean to meet us with SUV in Wiseman on July 5th and SAG the last miles of the Dalton. Before then Bert and I would cycle to Wiseman and Jean would explore other parts of Alaska. We also stopped at local Sears and Walmart for simple bike carrier. With some obligatory photos it was a little after 1pm when we departed. Hooray! 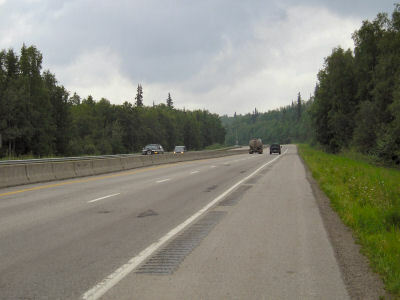 The first eight miles was on Steese Expressway, a four lane limited access highway. Fairly quick riding, with just a slight hill or two to cross. After eight miles the Steese narrowed to two lanes for final three miles into Fox. 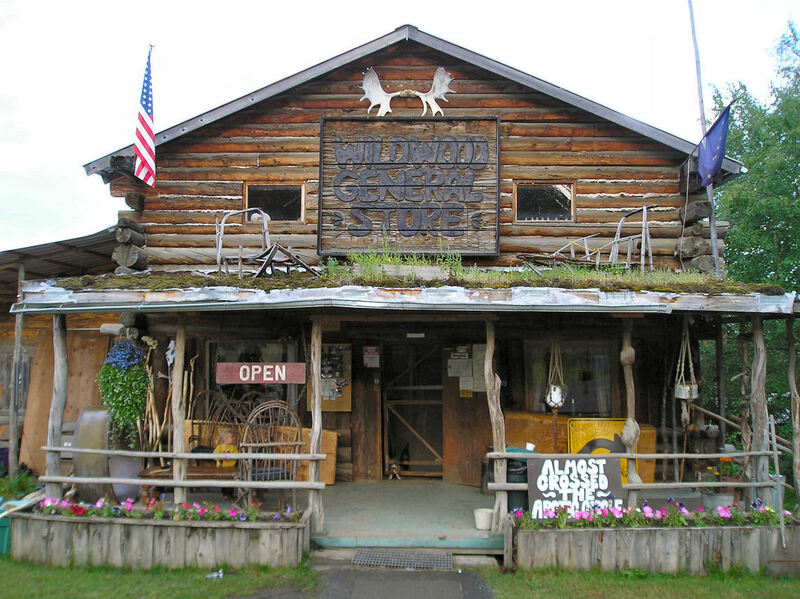 The town of Fox has a general store and a saloon. We stopped in the store for last chance to refuel before setting off. Some motorcyclists also here, destination was the Arctic Circle. From Fox the road climbed, the first of many general climbs as the road crossed multiple drainages. At 16 miles was Hilltop Truck stop. Bert continued but I stopped in. Met a Japanese bicyclist who was also riding the Dalton. Also saw maps for nearby forest fires. 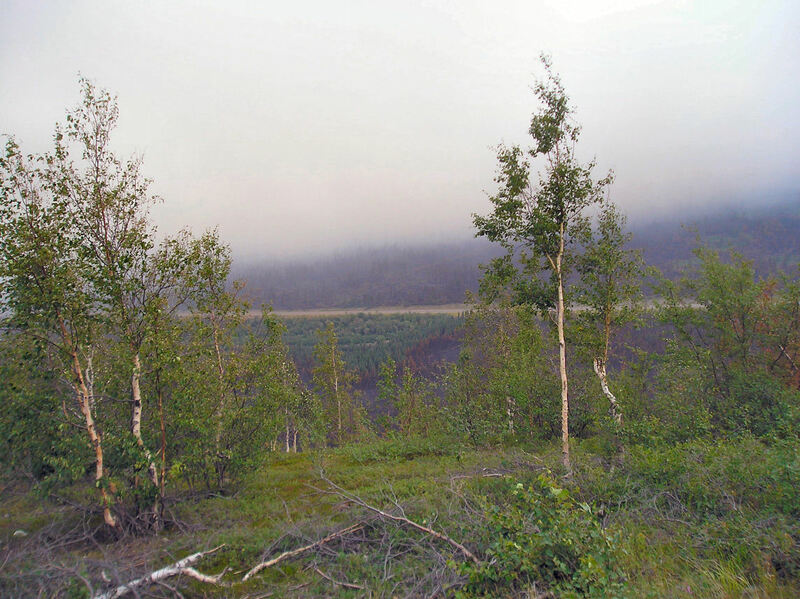 It is fire season in Alaska and many crews were out a few weeks before with hot dry weather. From Hilltop a descent to Chataika River at 22 miles and a little later a gradual climb to Wickersham Dome at mile 38. By then it was raining lightly. The new rain jacket did ok. 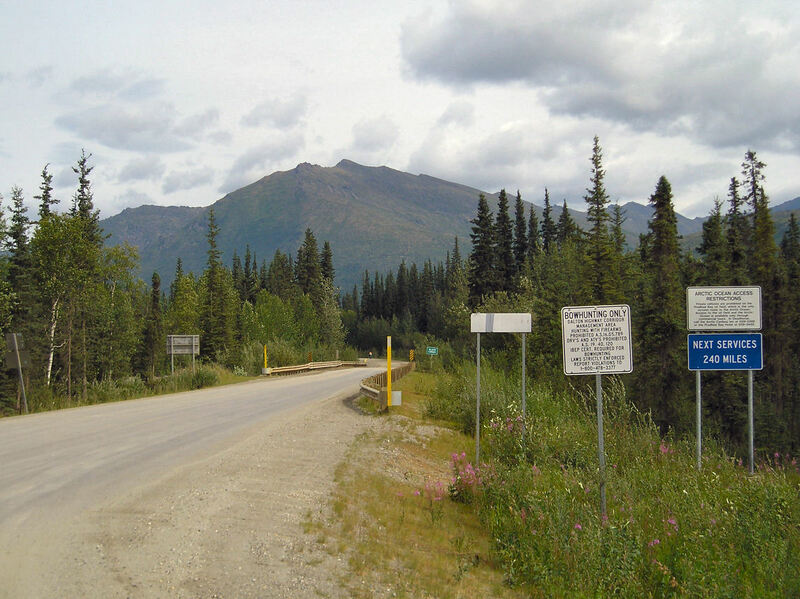 Along parts of this route we could see the 48 inch Alaska Pipeline we would follow all the way north. 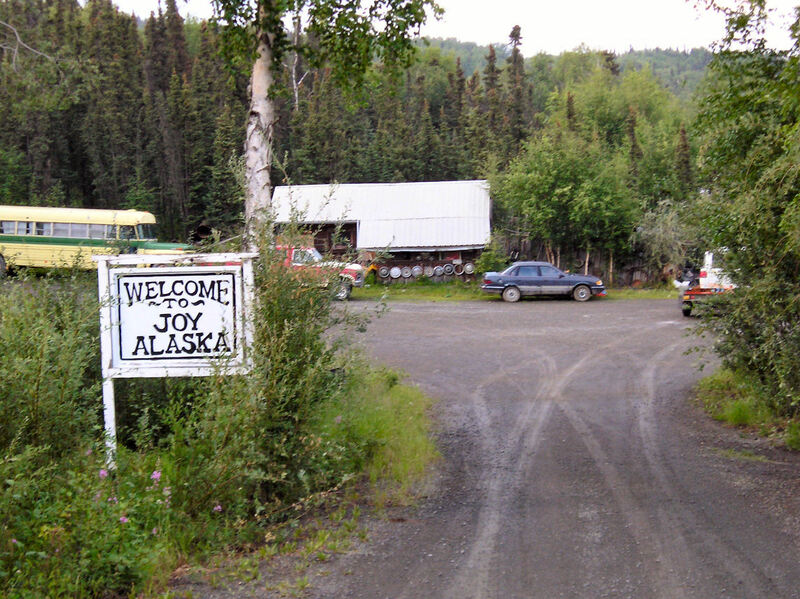 Without too much difficulty we climbed a few more grades and came into the "Welcome to Joy" sign at 60 miles. Yeah! 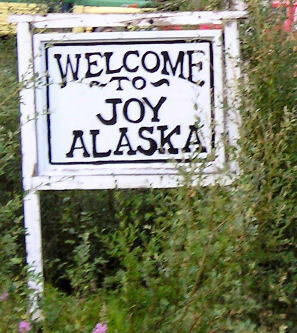 Joy was named for Joy Griffin but is now homesteaded by the Carlsons. They've raised ~23 children and now have grandchildren around. Despite the late hour, the main lodge had an "open" sign. I get the sense during the summer they are open whenever tourists stop by. 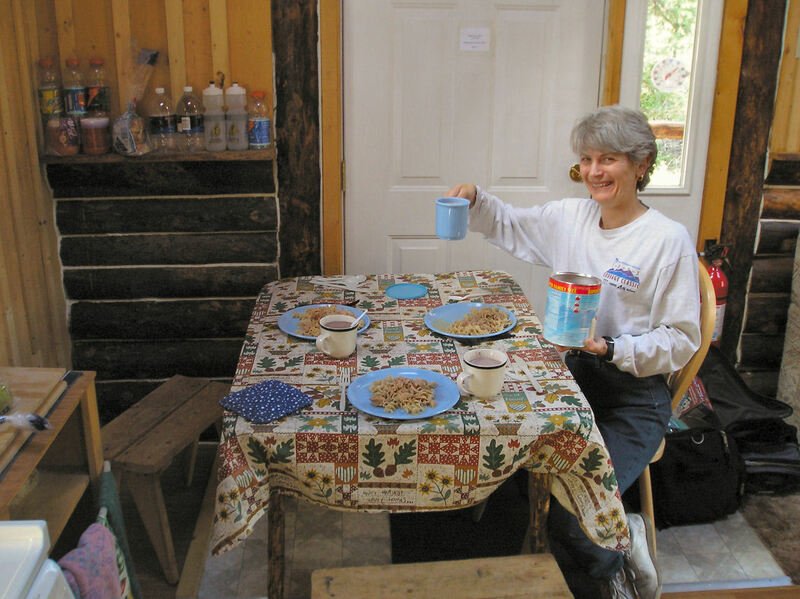 We found a place to camp next to nearby pond, and prepared dinner. Nice to be on the road again. A difficult ride today. More hills than we expected. Overnight some light showers and light fog starting out. 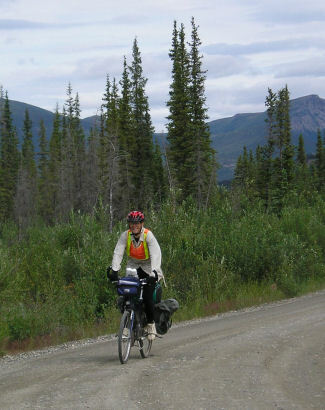 The first 23 miles of the route would be paved, after that 56 miles of gravel. 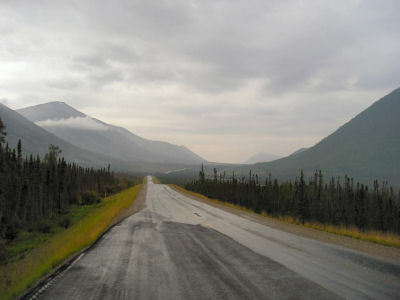 We climbed a few more hills and it rained coming our last miles of the Elliott Highway. Without too much difficulty, found ourselves at start of the Dalton around 11am. Yeah! From here it became more difficult. Not far past the "Pavement Ends" sign, the road began to climb sharply. It rained enough so there were rivers of water running down the road. The hill was steep enough, I walked part of it. Not long after this hill ended, a steep descent and another hill behind. This climbed steeply up. At four miles finally a descent, this one steeply into Lost Creek Valley. This was followed by a climb up the other side, to 9 miles, a steep descent to 12 miles and another climb. Our pace was glacially slow. Seemed like it took three hours for just 15 miles. Lots more steep hills than we expected. I mentioned to Bert, I might look for a pickup if this continued. From next climb, we did briefly find pavement from 19 to 23 miles. Another descent and across Hess Creek at 24 miles. We decided to ride up to 28 miles and see how things were. At 28 miles things looked bleak. 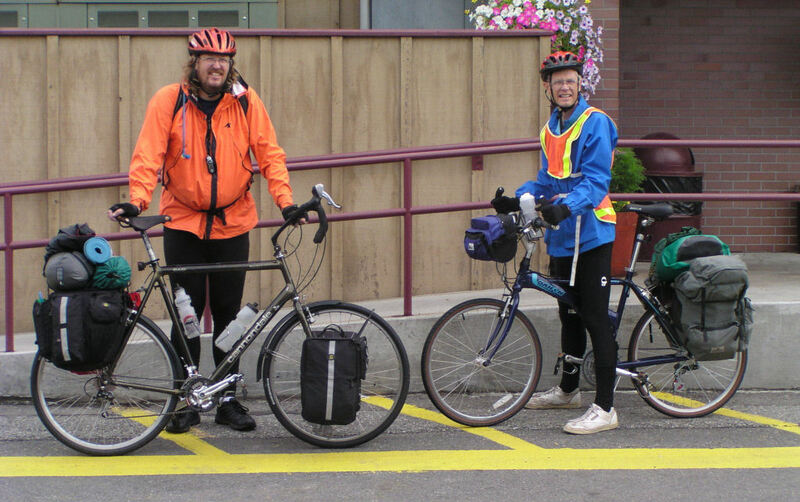 With the hills and heavy panniers, we were making ~5mph, meaning we'd get in between 9pm and 10pm. Ouch! Decided rather than burn rest of the day, to catch a ride. It took a little while, but just past 34 mile marker came pickup towing a boat. We caught a ride with them to Yukon River. The Yukon is huge river with large sloping bridge for both pipeline and road deck. On north end many fishermen parked, and also small motel/restaurant. We rented a room, nice to have soft bed to sleep. Overall a tougher day than expected. Hopefully, the others won't be as tough. A nicer day cycling today as we followed mile markers from 56 to 115. It also didn't rain at all today. The restaurant didn't open until 9am, so set off and see if we found anything at Hot Spot Cafe. The road was dry and hard packed gravel, making for faster riding. At 60 miles, the Hot Spot didn't open until 10am, so kept going. At 61 miles the road widened and had gates to block the road for landing aircraft. There was actually a separate runway next to the road, but close enough to close for traffic. At 67 miles our first steep hill. Fortunately, this seemed easier than yesterday. There were a few more after this including "the roller coaster" at mile 75. Along the way lots of spruce trees and forests. At 79 miles, No Name creek followed by gradual climb and steep hill at 87 miles. Not much past the descent, the road turned to chip seal pavement! Wow, while the road was occasionally rough, the pavement defintely was faster. We climbed a long steep hill up to Finger Rock. The rock formations are Tor's. 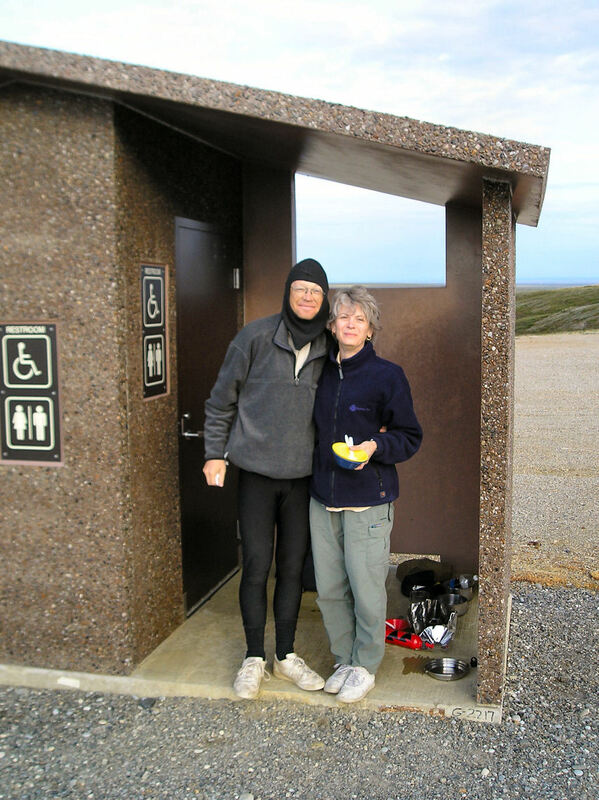 This place and some other pullouts had outhouses. As more tourists come, paving and amenities follow. From Finger Rock at 98 miles a great descent down into valley below. At 102 miles a sign for "gift shop/cabin rental". A friendly couple had lived here since 1981. Even had water on the porch for bicyclists. It was tempting to stop at the cabin, but made sense to get a few more miles. From here a gradual climb to 109 miles followed by a two mile gravel descent to 111 miles. 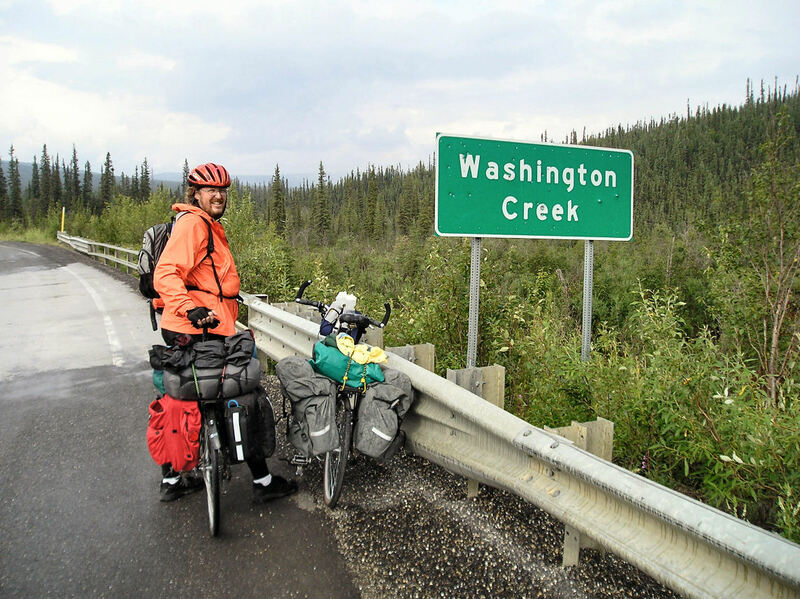 I stopped briefly at Fish Creek at 114 miles to purify some water before climbing last hill to Arctic Circle. There was a large sign here and steady stream of traffic stopping for tourist photos. The official campground was up the hill. However, after inspecting it, we opted for one of the picnic sites. I noticed two other groups did as well. There was a heavy smoke and some ash falling. Not far north of here forest fires were still smoldering. Nice to reach 66 degrees 33 minutes. A few large hills, some steady rain showers but otherall an easier day than yesterday. After an early night, we were off and on the road around 8am or so. A brief descent and then multiple mile climb at 116 miles. There was wind from the south and smoke had cleared overnight. 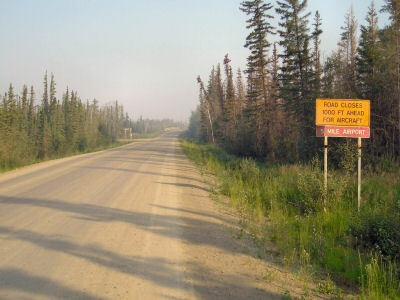 However at mile 119 as we descended to Bonanza Creek, we were back in the smoke. Lots of burned areas and a few still smoldering. A great descent down to the creek followed be a difficult climb at 129 miles. Another hill to walk part way. At the top it was cool as we came across Gobbler's Knob at mile 132. Another great descent and past large pump complex at mile 135. Not far from here Prospect Camp recorded -80F, a low for Alaska. 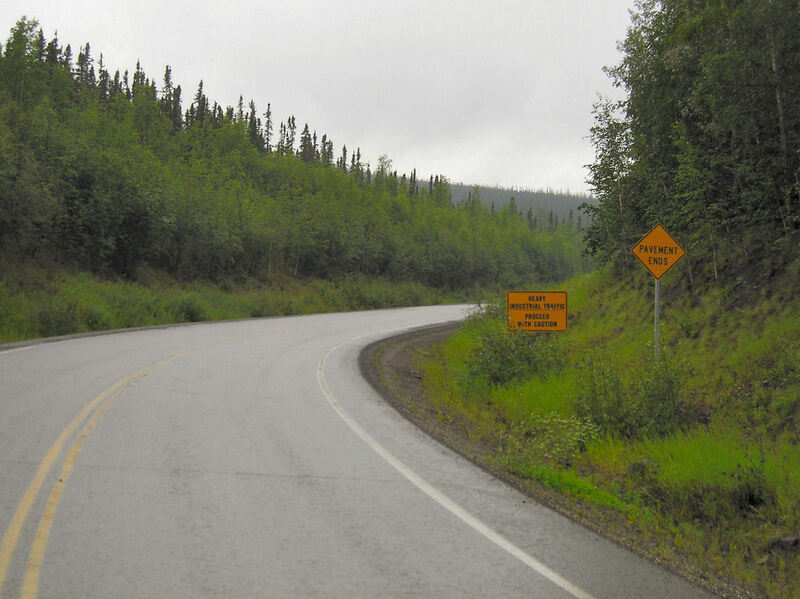 Also an Alaska DOT site. From here the road was a bit more level as we followed more of the drainage. A gradual climb to Grayling Lake at 150 miles. At this point it started to rain. Lightly at first, more heavily after that. We made a gradual climb into next drainage and then steep climb at 156 miles. 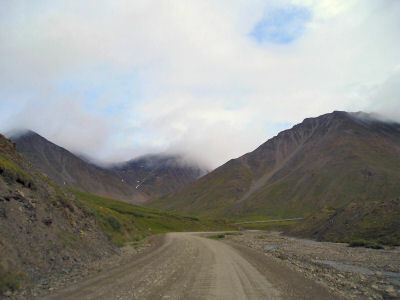 From here a descent into Middle Kolukuk River valley. The mountains started getting higher, the gravel patches in our paved road became a bit longer. However, overall still making good time. A steady rain to climb the hill at 170 miles and then more gradual. Made it to Coldfoot not too late. The Slate River Inn was built for oil field workers, but now houses tourists. Nearby restaurant had good buffet. 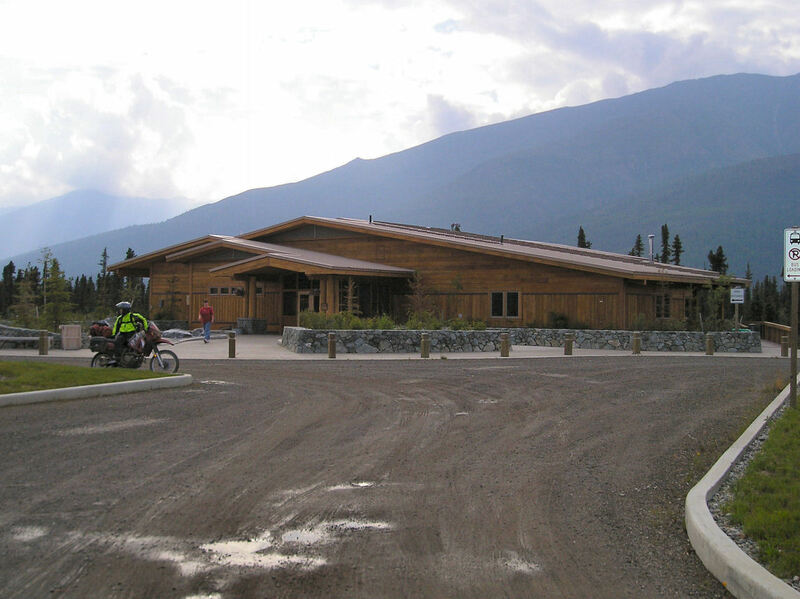 Also nearby was Arctic Intragency Visitor Center, a very nice facility explaining the area. Nice to reach Coldfoot after four days of sometimes soggy riding. A nice easy rest day today. The evening before we saw slide presentation at the Arctic Intragency Center. Todays plan was to bicycle 17 miles down the road to Wiseman. Hence we slept in and stayed in Coldfoot until lunch. 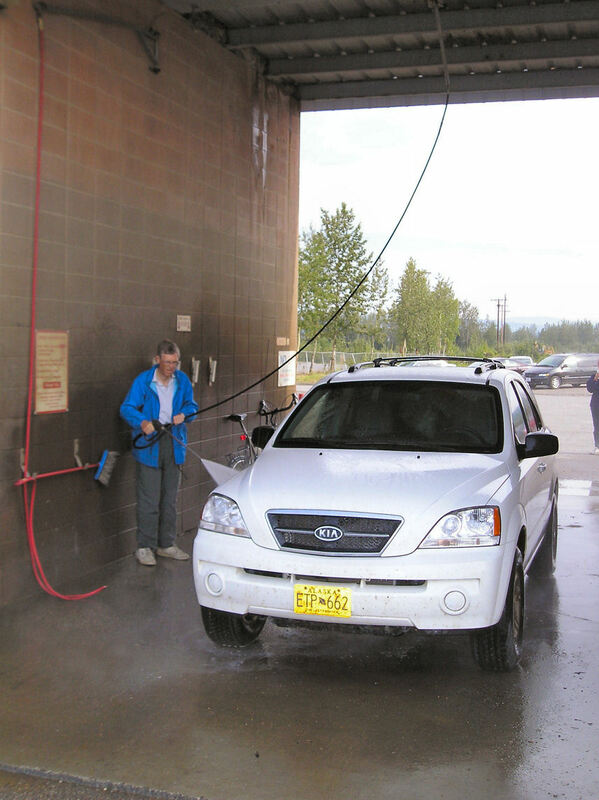 Coldfoot is an all-year truck stop. 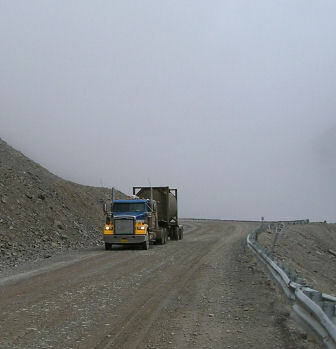 There is more truck traffic in winter (when ground is frozen and not marshy). We see some trucks now, but more tourist traffic. Hanging out in the cafe sees a steady stream of people stopping by. The walls have some interesting facts about the road (built in 154 days) and gold rush history. In the afternoon we were on the road again. 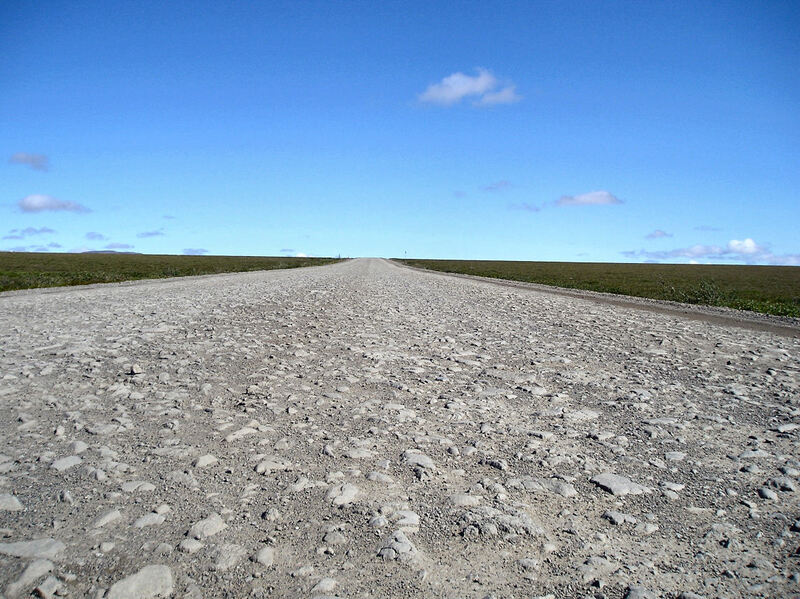 At 175 miles the road turned to gravel. Mostly flat as it went along the valley. Nice high mountains on either side. In the valley the Middle Fork of Koyukuk River we would follow up to the pass. Small spruce trees on either side. At 189 mile we crossed the river and turnoff to Wiseman. 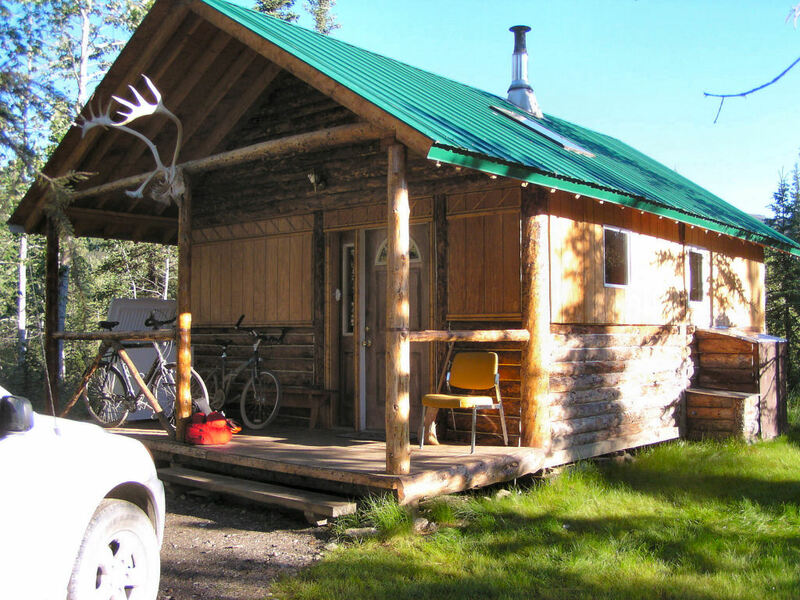 Three miles south and nice cabin where we stayed the night. My sister-in-law, Jean, met us here with SUV. Plan was for Jean to SAG us the rest of the way into Deadhorse. Over the Brooks Range today. Thanks to Jean's SAG driving, we were able to stay two nights in the delightful cabin in Wiseman. The goal for today was to get over Atigun Pass (mile 244.7) and somewhat down the other side. We took off at six am, full of energy for the climb ahead. Much of the early distance would be flat or very gradual climb. Most of the big climb in the last ten miles. As we left Wiseman, there was a sled dog team chained up. On dog started howling at us and before we knew it, we had an entire chorus. Temperature was about 50F and dry starting out. However clouds ahead that kept getting closer. Reasonable gravel road that kept our pace up. After three miles we joined main road at 189. 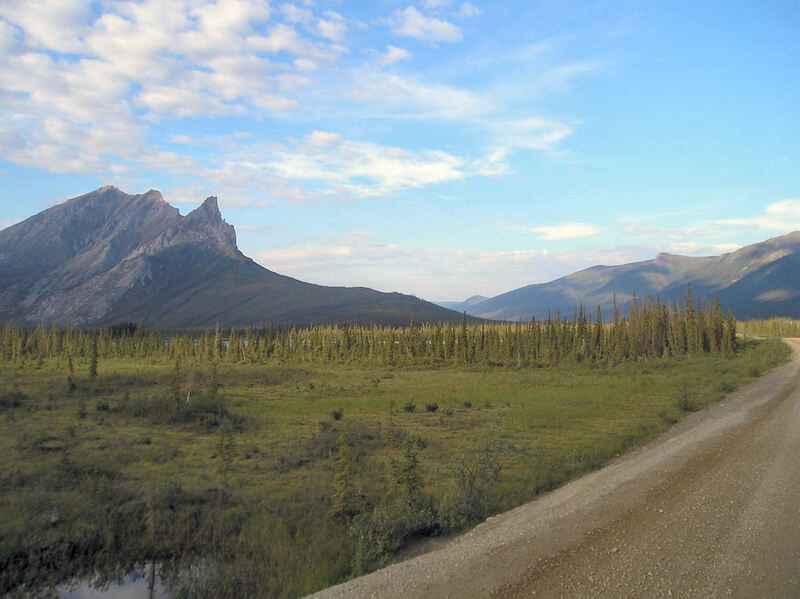 Not much further we could see a pointy mountain (Supakpak) that was traditional diving line of Eskimo and Athabascan Indian lands. We slowly made our way past the mountain at mile 204. 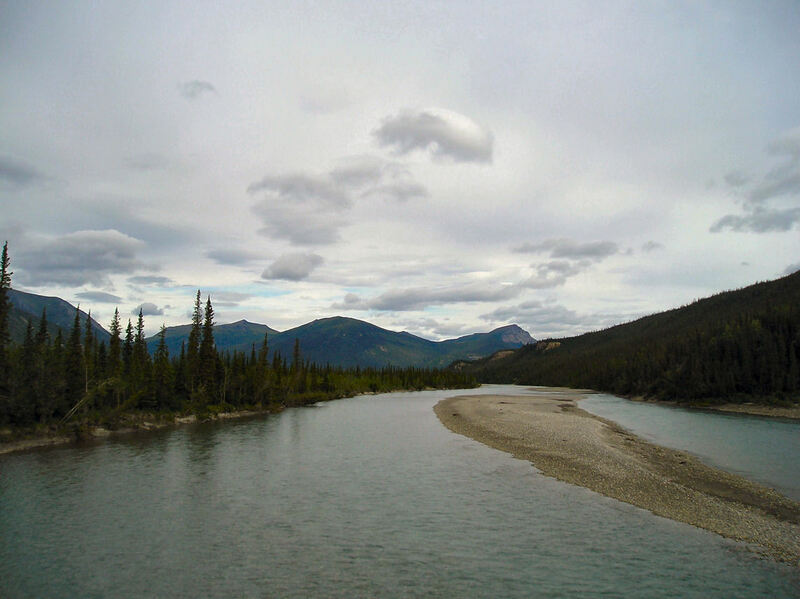 We crossed Dietrich River at 207, and followed this river further upstream. 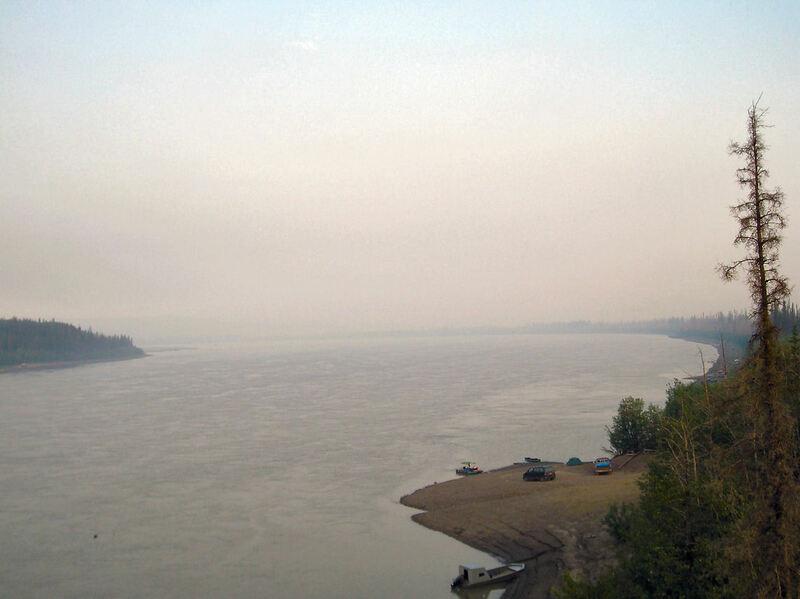 Not much further was sign for Dietrich, one of the former pipeline contruction camps. The pipeline was mostly above ground along the way but occasionally went underground. At points the pipeline pylons would have cooling fins (later found out these were $2000 each and installed in areas of unstable permafrost). We got some light rain in this next stretch. Enough to change coats. 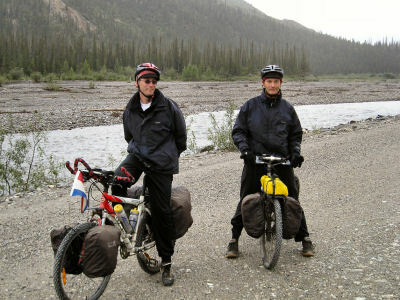 At mile 229 met two Dutch cyclists who were riding from Prudhoe Bay to Las Vegas. They told of bumpy roads ahead. 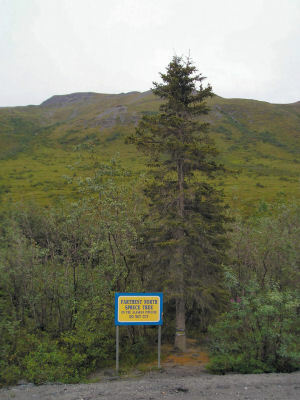 Made good progress and reached a sign for "last spruce tree" at mile 235. An outhouse not much further. This marked start of the climb. 10% grade for 1.6 miles in climbing up to Chandalar Shelf. A slow walk up the hill. At top, the road became rougher, and had a slight breeze. All around dramatic peaks of Brooks Range. 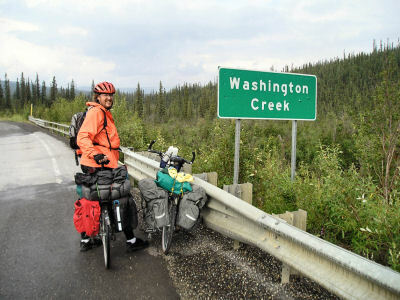 A slow ride at top of valley with slow climb past Alaska DOT work station and then "West Fork of the North Fork of Chandalar River" at mile 242. I bundled up here for final 2.5 mile long 12% climb to the pass. It was steep and slow but made steady progres. Top of the pass was in the clouds at mile 245. Not much view here, so started quick descent. This part had an increasing head wind, so sometimes as hard to pedal downhill. Road surface was also quite rough. After a few miles we found ourselves out of the clouds and in large valley with tall peaks. Rough road eventually smoothed out but headwinds increased. 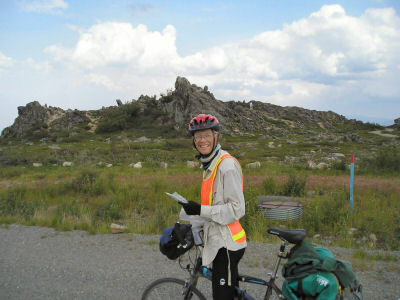 A bit of tough cycling to mile 262 where Jean in SUV coming behind us was welcome site. Yeah! We loaded everything and then started the drive back. Fun to retrace route over the pass. 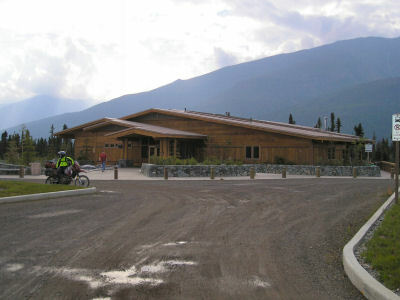 Went to Coldfoot for buffet dinner, visitor center for weather (looks good, tailwinds?!). After that back to Wiseman for restfull sleep. Beautiful weather today. No wind and sunny. The goal for the day was to cycle much of the distance, perhaps to pavement at mile 334. 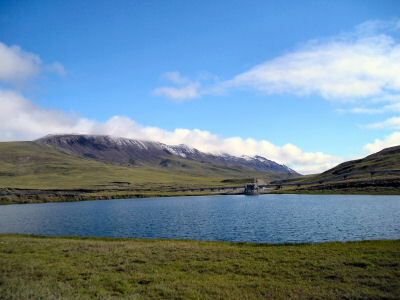 A little later starting today as we had breakfast, packed up the cabin and drove back over Atigun Pass to mile 262. It was cold but sunny starting out. 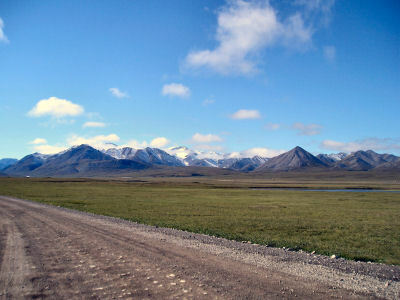 The route started in the wide valley with spectacular views of Brooks Range behind. After a few miles we passed pump station #4. This is highest pump station (at 2760 ft) and sends oil over the mountains. Got an interesting brochure yesterday which says ~1 million barrels travel a day, and oil goes at 4 mph and 140F. A little further, passed Galbraith Lake at mile 274. From here the road seemed to mostly go sideways, crossing over drainages, so sometimes tough riding. It was beautiful however to see mountain ranges behind. I stopped at Kuparek Creek at mile 289 to fill up water and then we met up for lunch at mile 298. From here finally a good descent. Met another cyclist coming up on mountain bike but no gear. 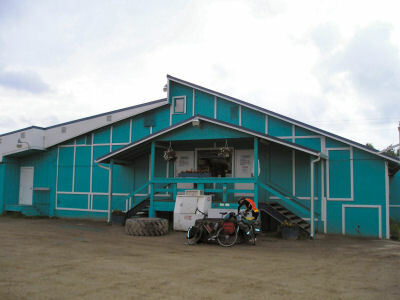 Said he was trying to break record for riding from Prudhoe Bay to Tierra Del Fiego and had support camper further back. words Ryans dream). It was very rough roads and I had a flat at mile 304. The road hinted at getting better but still mostly rough as I came to the Sag river at 309. Was making good progress with occasional slow climb over a hill. Kept going to 334 and Happy Valley. Yeah pavement! 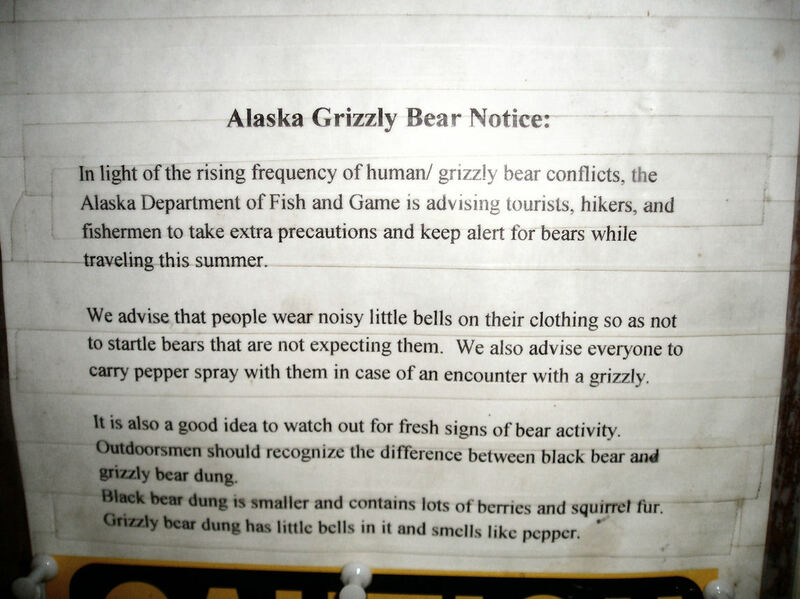 Lots of mosquitos here so we packed up quickly. Made our way 20 miles further where we camped at wayside, next to rest room. The wind was picking up, so lit stove behind the outhouse. Made it to Deadhorse end of the road! A storm passed through on todays ride, so wet. Our pavement lasted only 28 miles, so last 52 were flat but occasionally soupy, muddy mess. As I awoke, I looked at tents flapping. Tailwinds? Tailwinds! Yeah! 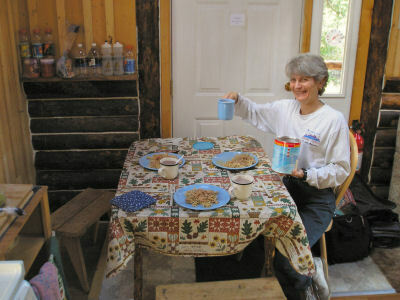 We made oatmeal, packed up and started back at Happy Valley at mile 334. First 13 miles went quickly with flat roads and tail winds. From here some climbing to 354 and way side. Long clouds had been approaching, and here it started raining. There was a good descent from 354 to 359. After this the winds shifted to strong cross wind with a head wind component. The rain also increased. To add insult to injury, back to gravel road at 362. This was starting to become a slog. It was flat and there were slightly cleared paths to ride on. However, trucks would come barreling past, so had to get out of the roadway. I kept a slow tempo. Jean leapfrogged a few times and at mile 377 we had lunch in the car. My glasses misted with trucks and rain, but kept slowly going. 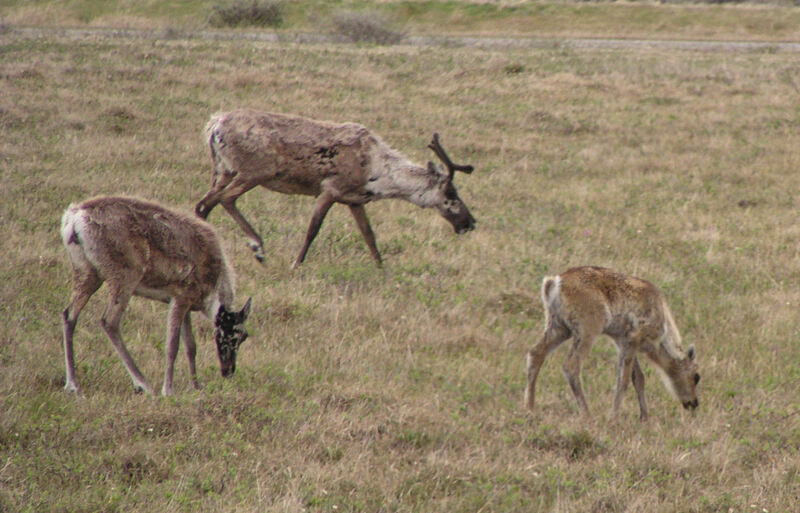 Not long after 400 I saw some caribou cross the road. Kept a slow pace as was going to 414 and end of the road. Deadhorse was visible from several miles out. These last miles were the most soupy riding and my bike was filthy. I counted down last miles with brief stops, 409, 410, 411, 412... At 413 there was brief hint of pavement but it went away. 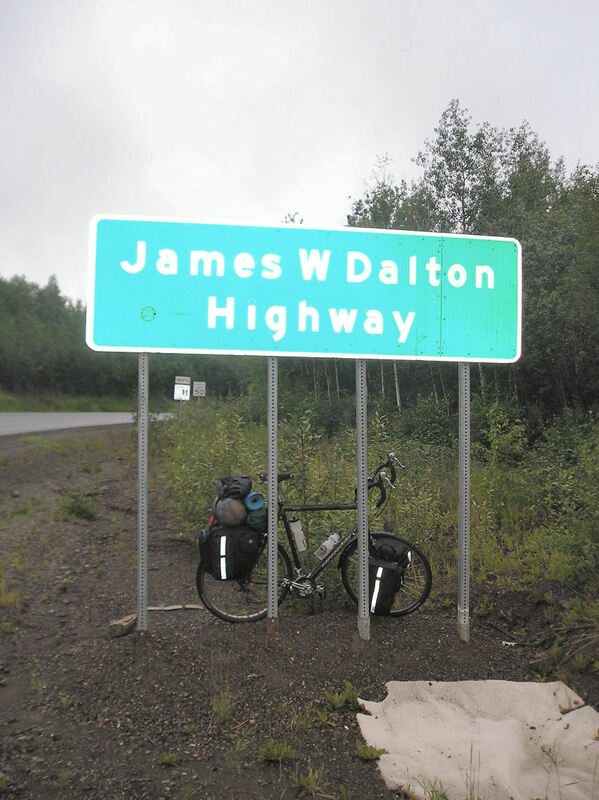 Finally saw "Dalton Highway" signs the other way. At mile 413.5 my rear tire exploded. Not sure why, and there was too much mud to completely diagnose. So I decided to walk last bit. Just as I was walking and came to 414, Jean and Bert came with car (Bert had SAGed from mile 371, and they had gotten accomodations set up). 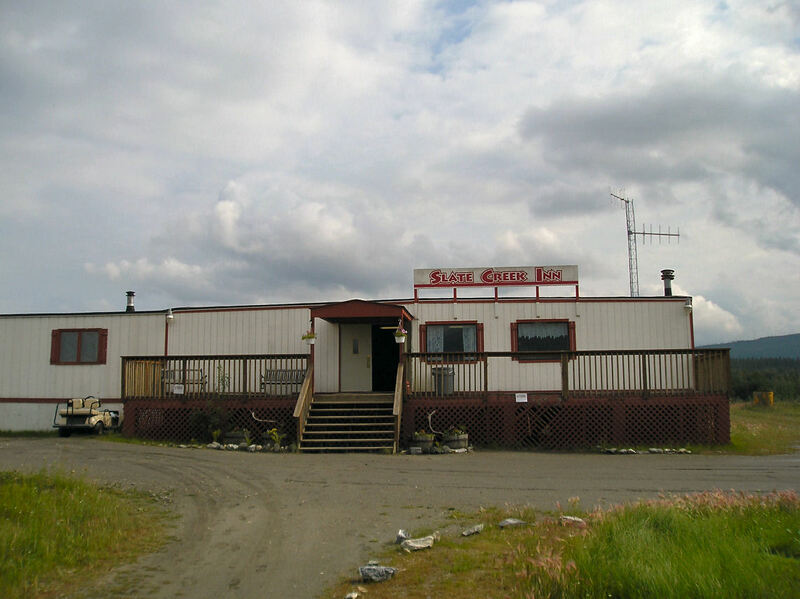 We drove to nearby Arctic Oilfield hotel. This is an industrial looking area with many sprawled out complexes. The oilfield hotel is part of one such complex and is constructed of large prefab pieces. Had a very good buffet dinner in the cafeteria and relaxed at end of a tough but spectacular ride. Made it to Deadhorse, yeah! 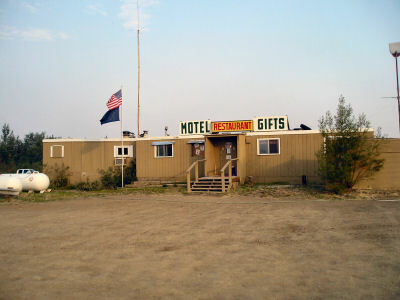 The Arctic Oilfield Hotel was an interesting place. Most guests are workers on a two-week 12-hour day schedule. 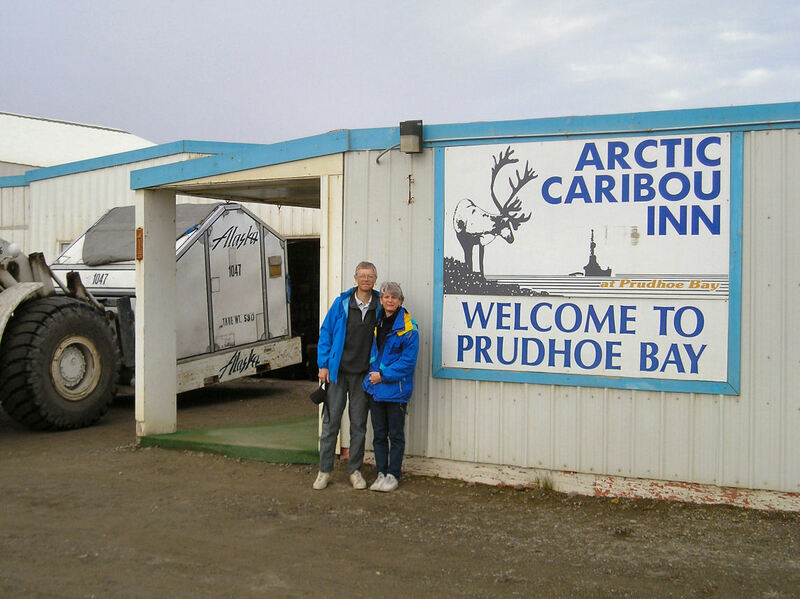 After two weeks in Prudhoe Bay, they fly home for two weeks off. People have decorated some of their rooms with posters or other door decorations. There was a cafeteria that served good meals. 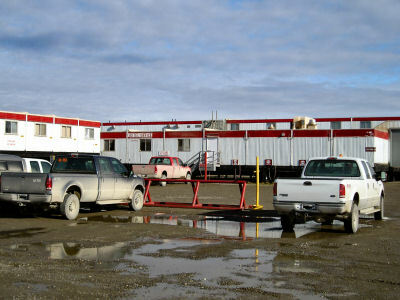 The nearby area was a "who's who" in oilfield. Each company seemed to have its own complex: Haliburton, Schlumberger, BP, Phillips, Veco, etc. The roads were mostly a soupy muddy mess since water trucks kept passing to water down the road. We took a morning tour of the oil fields. 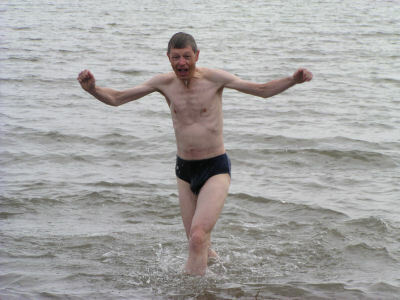 Photo at left is Bert chosing to join the "Polar Bear Club" by a dip in the Arctic Ocean. Both the air temperature and water temperature was ~35F. 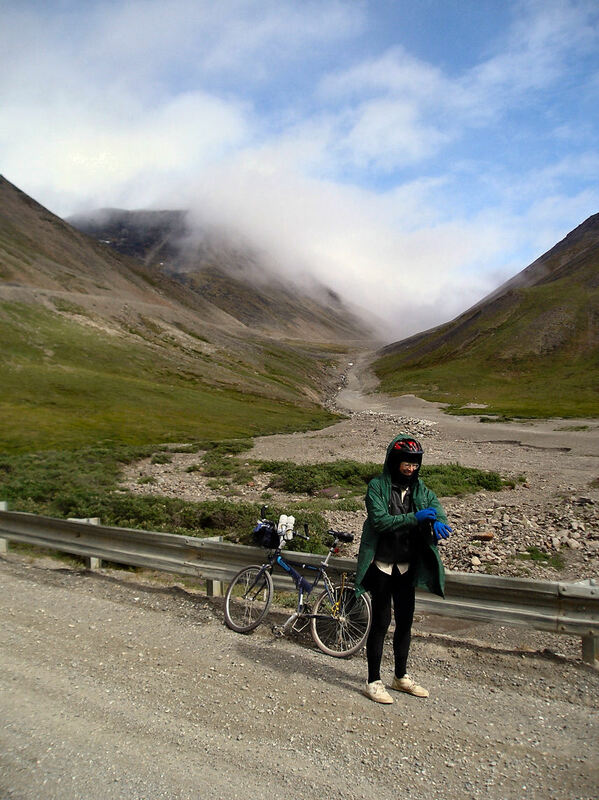 Biking to Prudhoe Bay was enough for me. I did however go back and walk the last little bits I had missed after my tire blew out. 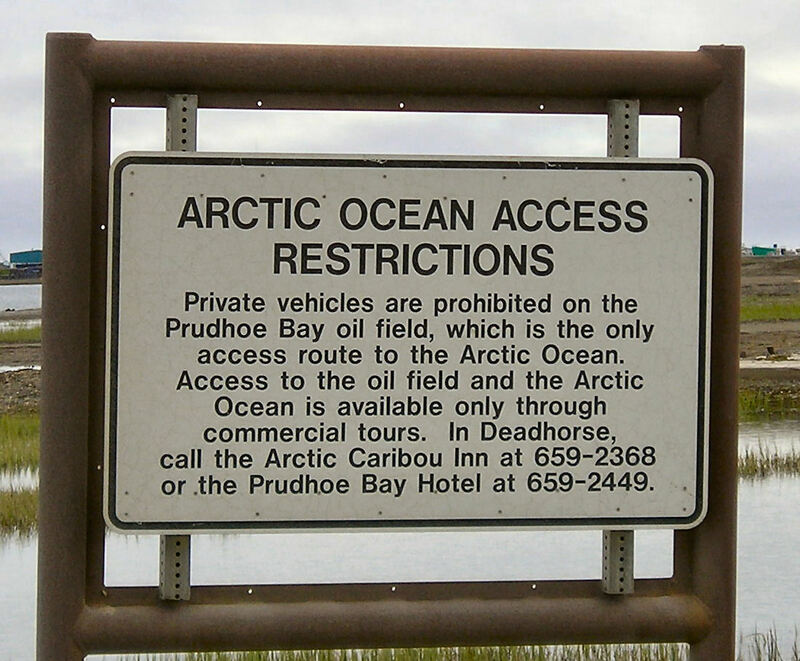 Estimates are that Prudhoe Bay oil fields have ~13 billion barrels of oil. Some of the early fields are in decline but they continue to find and drill new fields. When the first wells were drilled in late 1960s, they mostly went straight down and wells needed to be 100ft apart. Hence, the little pump stations at right each had a well. Since then, directional drilling technology has improved so that from one well they can drill 2-3 miles each direction. They can also place wells closer to each other. Oil exploration is more active during the winter than the summer. 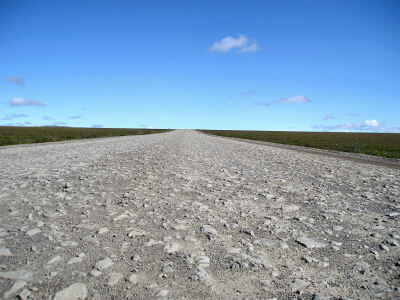 During the first half of the winter, ice roads are constructed by spraying water across the tundra. Large vehicles then travel across these ice roads. 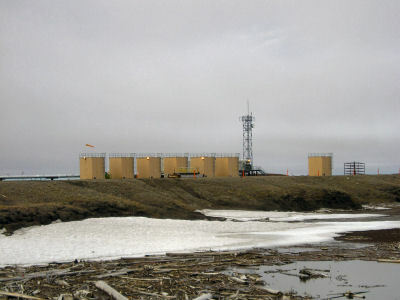 In some areas large gravel pads are built up to hold a cluster of wells. The argument from oil companies is this is minimal impact since a small 40-acre site can drill several miles each way, caribou and other wildlife are not around during the winter. 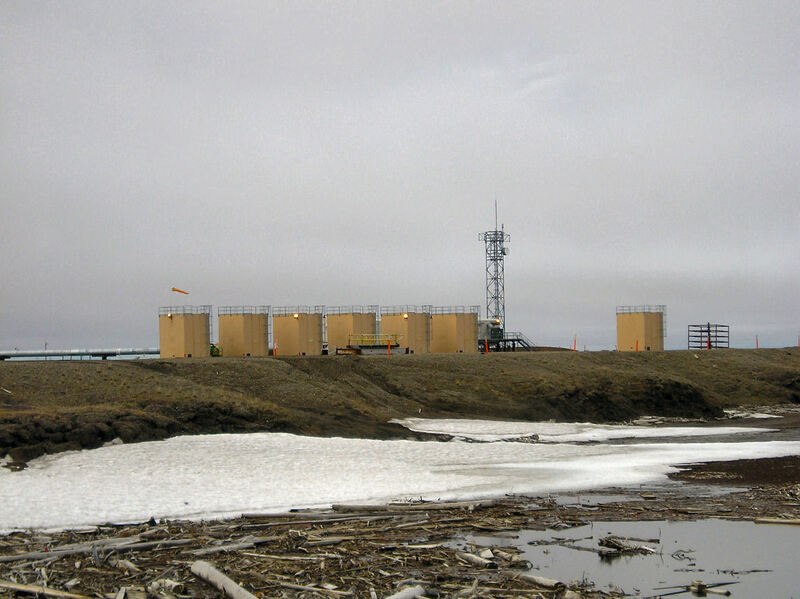 The wells yield a mixture of oil, water and natural gas. Oil is separated and sent down the pipeline at approximately 1 million barrels a day (~5% of US consumption). Water and natural gas are reinjected into the ground. Some natural gas is used to power the oil pumping stations and other machinery. However, the hope is that "soon" a natural gas pipeline can be built that will allow gas to be pumped south to rest of North America. I had heard of this natural gas wish for a long time, but from people we talked with, this seems to be a potential in next few years. Unlike oil, gas is pumped at cold temperature. 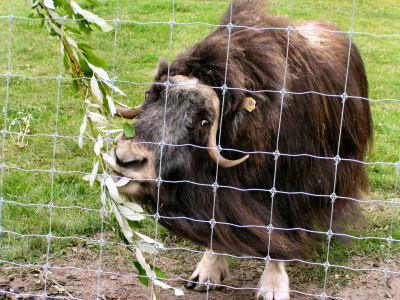 Hence, it should be easier to get across the permafrost regions. 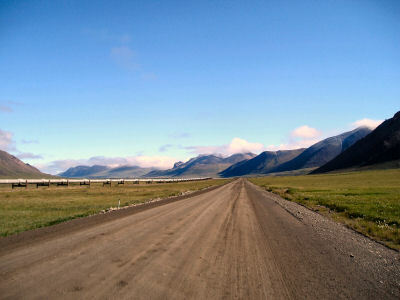 Our tour guide told us about the fields as we drove the last few miles to the Arctic Ocean. Here we got off and briefly wandered around the beach. Bert did his polar bear swim. After this we started the drive south again. Photo at left is back at Coldfoot and photo at right is the Hot Spot Cafe. We stayed overnight at the Hot Spot Cafe and hence have some familarity with all the lodging places on the road. 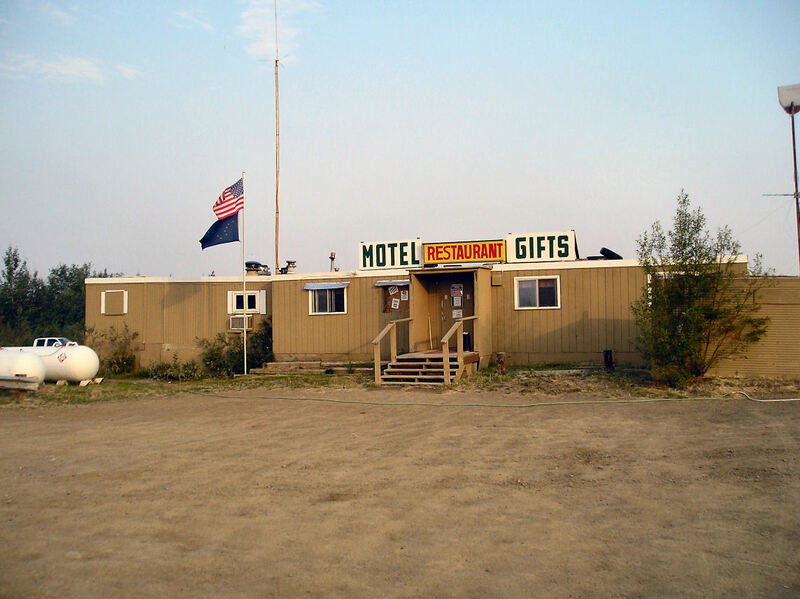 Next morning we drove the last bit to Fairbanks. We sent our rental car through the car wash to get the worst grime off. 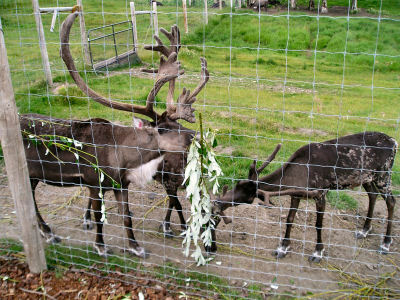 In the afternoon we visited the Large Animal Research Station in Fairbanks. We had seen a few musk oxen and some caribou on our bike trip, but this let us see them much more up close. All too soon it was time to finish the trip and fly home. Overall, I enjoyed the ride. 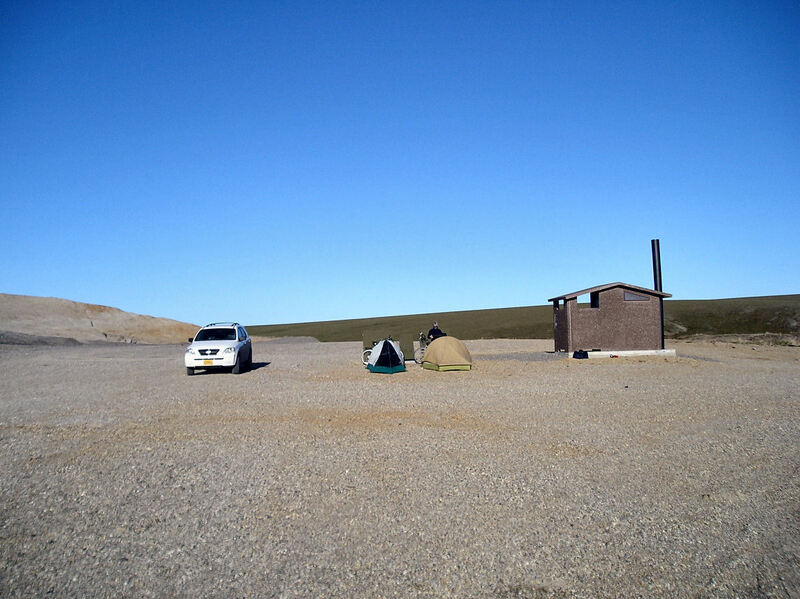 It was a good balance of being remote but also having some places to stay. 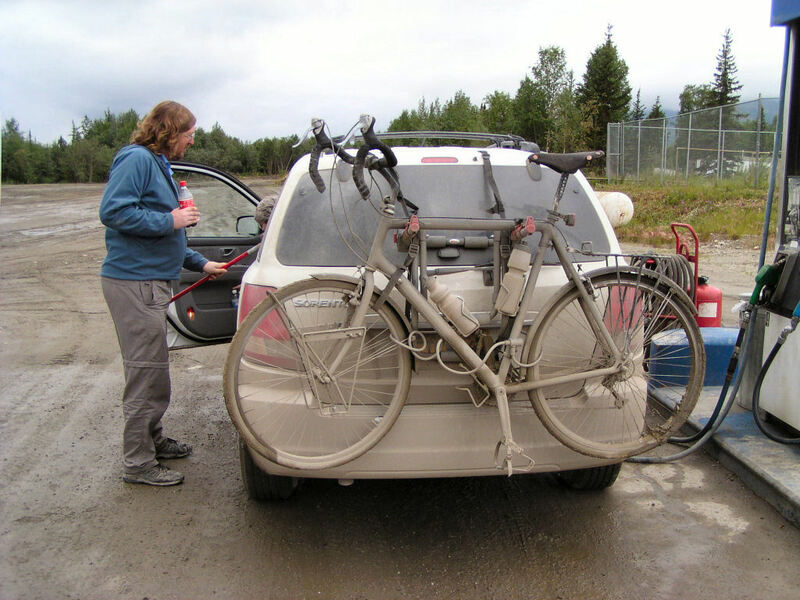 A SAG vehicle also made that a bit easier for this ride.